Supergirl continues to work around Melissa Benoist’s absence in “Ahimsa,” this time focusing on Alex’s (Chyler Leigh) struggles as DEO Director and J’onn’s (David Harewood) search for his friend Fiona. There were plenty of intense and emotional moments throughout the hour, though the results were overall mixed based on whether they pushed previous character plots forward or dragged them backwards. First and foremost, Alex took center stage amidst all the drama surrounding the DEO. It was revealed early on that a second agent had betrayed the team and gone over to the Graves side, resulting in an attack which the agents were unprepared for and which Kara (Melissa Benoist) helped fend off in her limited-mobility space suit. Naturally, the President was none too pleased with this display – and while he seemed like a world class jerk, he did have a semblance of a point – and Alex was left feeling very vulnerable. Her insecurities about being the leader and fear of failure were perfectly understandable, especially given the sheer number of perceived failures dropped in her lap after a string of strong episodes, and Leigh gave her all in every scene. The only issue here was the lack of Supergirl in Supergirl, because it meant that Leigh had to act opposite a suit of armor for most of “Ahimsa.” Kara’s scenes from inside the suit were spliced in later, and the disconnect was pretty noticeable. But technical difficulties aside, the episode showcased a lot growth in the sisters’ dynamic. Even when Alex took out her frustration on Kara, the latter understood her sister’s feelings and respected her as the leader. Of course, Alex also had the moral support of her old boss, and J’onn brought his wisdom and kindness in a much needed scene between the two. In the end, Alex let Kara fight the Graves siblings and their minions in order to protect the fairground they were attacking, and the battle was a success thanks to the efforts of Brainy (Jesse Rath) and Lena (Katie McGrath) in cleaning up the atmosphere. This apparent disobedience did not please the President any, however, and Alex will have to deal with monitoring from the no-nonsense Colonel Haley. Not sure where that story’s going yet, but more screen time for Alex is always welcome. 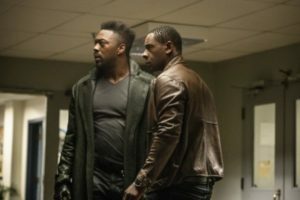 Coronel Haley wasn’t the only new face in this week’s Supergirl, as we were finally introduced to the glorious Manchester Black (guest star David Ajala). As Fiona’s fiancé, he inserted himself into J’onn’s search for her and the two wound up becoming close after an adversarial first meeting. Ajala played the character with charm and gravitas, combining a sarcastic know-it-all exterior with the vulnerability of a man who might lose the love of his life. And though their scenes worked perfectly, it’s a shame that an episode named “Ahimsa” in honor of Fiona’s belief in nonviolence ended up killing her all over again. In a stunning example of stuffing women in refrigerators, Fiona was kept (barely?) alive for four episodes only for her to die the moment J’onn and Manchester find her. Apparently the Graves siblings and Agent Liberty were using her powers to control certain humans and aliens, and for some reason she could not outlive her usefulness to them. The pain of the two men who cared for her was certainly moving, and I hope we will see much more of Manchester in the future, but it was not worth watching her die again. I would be remiss if I didn’t mention how Supergirl has thus far failed to amplify the voices of women of color, and a storyline about discrimination would be the perfect time to start. But instead of letting Fiona lead the resistance by J’onn’s side, they shipped her off to the afterlife with a passing nod to her entire way of life. Speaking of wasted lives, both Graves siblings were taken out this week. It was obvious that Supergirl had chosen Agent Liberty as its Big Bad and the other two were just pawns, but then why try to make them the masterminds in the first place? It felt a little haphazard to reveal Ben Lockwood’s backstory one week only to have him take over the entire operation the next. Even though Alex, Kara and the DEO beat Agent Liberty in hand-to-hand combat, his side achieved a major media win. James (Mehcad Brook), unable to stay put when people were hurting, went out as Guardian despite Nia’s (Nicole Maines) advice to lay low. This wound up resulting in a commendation for him rather than a condemnation, but it was for all the wrong reasons. Suddenly he was being touted as the pro-human (and therefore anti-alien) response to the so-called roaches, which is far from the outcome he hoped for. We can be sure that the villain will use this to his advantage now that he’s experimenting on humans to give them alien powers as well. “Ahimsa” also included another doppelganger scene, showing that the other Kara was also in hiding during the Kryptonite exposure and could now resume her training. But to what end? It still has no connection to the Agent Liberty storyline, so fans will have to wait and see what use they make of her. Hopefully better use than they made of poor Fiona or of the Graves siblings. Supergirl airs on Sundays at 8/7c on the CW.